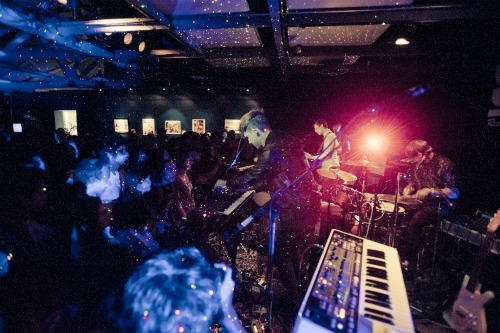 I was warned long before Wednesday’s sold-out show at SOhO that STRFKR could throw a party. But even an earful of secondhand hype can’t truly capture what these Portlanders bring to the stage. On record, the trio creates an eerily catchy mix of found sounds, chimey synth notes, and big open guitar chords, all tied together by frontman Josh Hodges’ childlike falsetto and dark to the point of sinister lyricism. On stage, at least for this round of touring, STRFKR appears as a five-piece, with Hodges’ voice lying low in the mix and the synths taking the sonic lead. The band also comes equipped with its own canopy of colored twinkle lights. Hitting the stage just before 10 p.m., Hodges and his cohorts quickly assumed their positions and politely asked to the folks in the booth to kill the lights. Swathed in darkness and a couple thousand tiny LEDs, the band made quick work of transforming SOhO from nondescript venue space to lively night club. And with the added manpower, it wasn’t hard. Things kicked off melodically enough with “German Love,” off the band’s 2008 self-titled debut. Colored by all manner of psychedelic synth notes and guitar parts, “Love” acted as the perfect accompaniment to the band’s tripped out light show. Still, it wasn’t until Hodges plunged into “Bury Us Alive” that things really got cooking. With a team of five behind it, the song’s swirling keys turned into a veritable wall of sound, pushed along by Hodges’s at times barely-there vocals and a handful of catchy samples. From there, the setlist began to feel like a well-orchestrated game of one-upmanship, with each song seeming to trump its predecessor in how big a dance party it could stir up. Highlights (“Rawnald Gregory Erickson the Second,” “Julius,” “Quality Time”) were delivered joyously and loudly, and on several occasions even got the venue’s floors rumbling. Of course, as good party hosts do, the band saved the big, anthemic number for the finish, delivering a buoyant electro-psych version of Cyndi Lauper’s “Girls Just Wanna Have Fun” at the top of their encore. Cheesy? Maybe. But considering the number of ear-to-ear grins and sweat-soaked t-shirts I saw leaving SOhO Wednesday night, maybe that’s just how all nights should end.